Multiplication is actually repeated addition. So, 4 times 3 tells us to add four 3's and 2 times 5 tells us to add two 5's. And, like addition, multiplication is commutative -- order doesn't matter. The product 7 × 3 is exactly the same as the product 3 × 7. We can multiply forwards or backwards and get the same answer. However, finding sums rather than products is not very efficient when we want 36 times 9. First of all we'd have to turn our paper sideways to write thirty-six 9's and all those plus signs, then it would take us a long time to find the sum. So, instead of making life difficult for ourselves, we learn the multiplication tables and we learn them well. To find the product of any two numbers in the table, locate the cell or square where the row of one number intersects the column of the other number. The table shows us that 4 × 7 = 28 because we see 28 in the cell where the 4th row intersects the 7th column. Ever since people started studying math, students have complained when it came time to memorize the multiplication tables from 1 to 9. So, let's look at the table of products to find information that helps us learn to multiply without too much suffering and complaining. 1. There are ODD numbers and EVEN numbers. EVEN × ANY NUMBER is EVEN. All products under 2, 4, 6 and 8 in the table are even. Also, the products under 8 are double the products under 4, which are double the products under 2. So, if we learn the 2-times table, we can work out the 4's and 8's by doubling (multiplying by 2). 2. If we know the 3 times table, we know the 6's and the 9's. Under 6, the products are double the 3's, and under 9 they're triple (3 times) the 3's. 3. Now the 5's and 7's -- both prime numbers. Under 5, every odd multiple ends in 5, every even one in 0. Because we know the 2-times and 3-times tables, we know the 5 and 7-times tables. 3 × 5 = 3 × (2 + 3) = (3 × 2) + (3 × 3). we add the products in the 2- and 3-times tables. we add the products in the 3- and 4-times tables. Since multiplication is repeated addition, it has the same properties as addition. This means that both the commutative and distributive properties apply. So, we can multiply forwards or backwards and get the same result, and we can distribute or hand out the multiplier to a sum We can use this approach when we multiply any size numbers by a one- or even a 2-digit number. 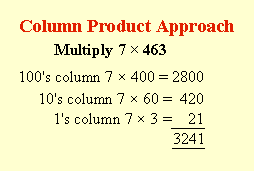 When we multiply by a 1-digit number, we can use an approach like the Column Sum approach to addition called the Column Product Approach. We write the products of the multiplier with each column -- properly aligned -- and then we add them. With this approach, it's best to start with the largest value column on the left so we can line up the places correctly. do the practice exercise(s), then check your work with the solutions. If you get stuck, review the examples in the lesson, then try again.